BlackBerry Curve posters at T-Mobile | BlackBerry Blast! Promo posters from a local T-Mobile store have been published by Pinstack. A user happened to see the posters and took some pictures with his BB Curve. 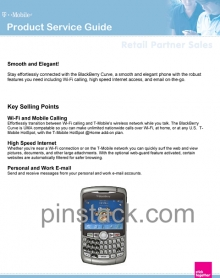 It is now confirmed that T-Mobile will be offering the BlackBerry Curve soon. The BlackBerry Curve 8320 is expected to come with Wi-Fi and support T-Mobile's Hotspot @Home dual-mode service.